If you want to build your own garden pond but don’t want to pour cement over the basin, you need a reliable pond liner to make sure the water doesn’t drain into the ground. 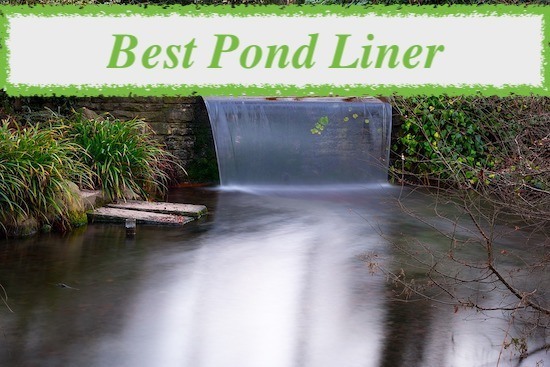 We often get asked: what’s the best pond liner? Unfortunately, there is no right answer to this question. There are plenty of models on the market, and choosing one depends on your purpose and pond size, apart from the product’s specific features. 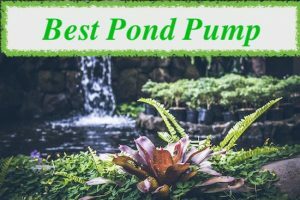 We’ll start this article starts with a short buying guide, we’ll then jump to some pond liners comparisons and, at the end, an F.A.Q. section where we answer the most common questions. Before buying your pond liner, stop and think where you will place it, especially if it will be directly exposed to UV rays. As you can probably imagine, UV rays aren’t great for pond liners. It’s fine if you’re burying the pond liner under cement, otherwise, choose liners that have a UV coating. Some materials are toxic to the vegetation and animals that reside in your pond, so choosing a bio-friendly pond liner is an essential factor, especially if you’re using it for koi ponds. If that’s the case, you want to stay away from materials treated with dangerous chemicals. For instance, arsenic poisoning is a real danger for fish. Arsenic is fatal to plant life so, even if you don’t want to grow fish in your pond, keep in mind that a lush flora only makes it look better by oxygenating it. The materials you’re choosing for your pond liner can affect your warranty too, and the best ones are hands-down those for RPE, that can last for decades. Even so, the price dictates the design and construction quality, so a cheaper pond liner might last less than a more expensive one, even if they’re both made from RPE. That’s why you need to take into account the warranties offered when you buy a specific product. Check under which conditions you can claim this warranty and which specific parts are actually covered by it. It helps to read various user reviews and check if the brand you’re buying the pond liner from is renowned for its responsive customer service or not. With all the above factors taken into account, you can see why the materials and craftsmanship are capital to make an informed pond liner comparison. There are two main categories of pond liners, each with their pros and cons. Hardshell pond liners are manufactured from preformed moulded plastic, which makes them strong, durable and resistant to punctures, as well as all sorts of wears and tears. If you’re a newbie when it comes to taking care of your pond, hard shell liners are the optimum choice, especially if you have a smaller pond because they’re easy to install. Another reason is that you will know exactly how your pond is going to look like, before making the purchase. On the other hand, hardshell pond liners have some drawbacks, starting with a limited number of options and the fact that they can’t be fitted for bigger ponds. Besides, considering that they’re massive and heavy, they’re difficult to transport. And finally, they don’t offer a lot of planting shelves, which puts you at a disadvantage if you want to build a natural pond. Flexible pond liners, just as their name suggests, are manufactured from a soft and flexible material, which allows them to be folded and rolled. 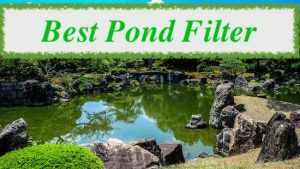 They are the preferred choice of pond enthusiasts, particularly because they offer various design options and they can be transformed into any shape. Because flexible pond liners can be folded, they’re more compact and therefore more portable than hardshell pond liners, even if some are still fairly heavy. Besides, you can use these flexible liners for larger ponds because it’s easy to connect them. On the other hand, these liners take more work to set up. Their softer construction also requires an underlayment material, but we’ll discuss this in the FAQ section. After reading this buying guide, we can move on to discussing some of the best products on the market, keeping in mind the characteristics that make them unique and valuable. This pond liner is one of the best value for money products in its category, with a lot of qualities that recommend it. For instance, it comes with a valuable 40-year guarantee, which is a great help for gardeners who don’t want to change their liner frequently. In fact, this polyethene liner is specifically intended for DIY-ers, considering it’s so flexible and easy to set up. Another plus is the UV-resistant coating, so your pond doesn’t have to be located in the shade, nor do you have to bury this liner under cement. The free included underlay saves you some money too, considering that its usual selling price is £1.50 for 1 sqm. And you have plenty of sizes to choose from on the main product page, even though this particular model is 6 x 5 m.
On the other hand, this underlay isn’t extremely resistant, so it won’t perfectly protect the liner from sharp rocks or roots. And once it starts tearing, it doesn’t stop. That’s why you should get rid of any sharp objects in your pond and, ideally, cover it with a layer of sand first. This pond liner from BPS is one of the cheapest pond liners on the market, even when you compare it with the PondHero liner. This particular model is 6 x 6 metres, but there are other options on the main product page. However, the array of options is fairly limited. One of the advantages is its manufacturing from a tri-laminate LDPE. LDPE is a sort of polyethene, so it’s one of the most durable materials on the market. The tri-laminate design means that it consists of three layers, which increases the overall durability of the BPS pond liner. Don’t forget its resistance to UV rays and rot, which further explains why the liner has a long life expectancy and a lifetime guarantee. The good flexibility of this material recommends this liner for ponds with irregular shapes, even if its thickness is 200 grams/sqm. Another advantage is that the liner is PVC-free, so it’s non-toxic and ideal for fish ponds. This product also comes with a free underlay included in the package. On the other hand, neither the liner nor the underlay isn’t particularly thick, so, again, you need to remove sharp objects from the basin of your pond. This pond liner from Certikin is 2 x 3 metres, which is better suited for small ponds, and there aren’t a lot of other size options on the main product page. Black PVC, the material it’s manufactured from, is one of the most flexible on the market, so you can use this liner for small ponds with irregular shapes. However, the liner itself is difficult to set up in a regular, round or rectangular shape. It’s not particularly thick at 0.5 mm, but it comes with a valuable 10-year guarantee, even 20 years if you’re pairing it with the Heissner underlay. Even if some PVC liners aren’t safe for fish, this product isn’t toxic at all. Besides, it’s also fairly resistant to UV rays, cold weather and even tears. So you don’t need to cover your ponds basin with sand before setting this liner up, though you could clean it up a bit. What is the Best Pond Liner Material? We have discussed the main differences between hard-shell and flexible pond liners, but there are plenty of materials to take into account here. Hard-shell pond liners are usually made from plastic or fibreglass. Plastic liners are usually small, which makes it increasingly difficult to build a true ecological balance. A smaller water volume also leads to overheating, which disrupts the fish environment and makes a good home for algae. However, plastic liners are cheap, portable and easy to install, particularly for newbies who want to have a small pond in their garden. Fibreglass liners are more expensive than plastic liners and they’re less portable. However, they’re more resistant and prevent water from overheating, so they’re a far better choice if you want to have a koi pond. Flexible pond liners are usually manufactured from PVC, reinforced polyethene, butyl and EPDM, each with their own set of pros and cons. PVC liners are the most affordable from the batch, they’re fairly flexible and easy to find in plenty of hardware stores. These liners come in all shapes and sizes, but they’re not UV-resistant. More importantly, some PVC liners use plasticizers that are harmful to fish. Reinforced polyethene liners are the most durable on the market, lasting for decades. They’re resistant to punctures thanks to their reinforcement and fit large ponds, especially because they have panels as large as 5500 sqm. Even if they are reinforced, they aren’t stiffer than other flexible liners. Butyl liners are made from a synthetic rubber, which makes them extremely flexible and therefore suited for ponds with irregular shapes. Butyl liners are even good for rectangular ponds because they can be joined with a process called box welding. Other advantages are that they’re safe for fish and that their shelf life is about two decades. EPDM liners are another fish-friendly material, made from a different sort of synthetic rubber, with an equally long life expectancy as butyl liners. On the other hand, they can’t be welded like butyl liners, so you need a butyl tape if you want to build various shapes that fit your pond. On the other hand, EPDM are pretty thick, so they’re more difficult to fold albeit more sturdy. As such, use plants or rocks to hide unattractive folds. Say your pond is 4 metres in length, 3 metres in width and 2 metres in depth. Multiply the pond’s depth by 2: 2 * 2 = 4. Add 0.03 m for anchoring: 4 + 0.03 = 4.03. Determine the liner’s length: 4 + 4.03 = 8.03 metres. Determine the liner’s width: 3 + 4.03 = 7.03 metres. Or, even easier, you can let this calculator do the maths for you. What is the Recommended Pond Liner Thickness? Thickness refers to two concepts: the depth of your liner, which is measured in cm, and the surface density, measured in grams/ sqm, which shows how closely-knit the liner’s fabric is. 0.75 mm liners are flexible, versatile and can accommodate smaller ponds with less fish and vegetation. 0.85 mm liners are more durable but equally flexible. 1.00 mm liners fit ornamental ponds with a fixed shape. They’re box-welded and are better suited for ponds that can’t have any overlay protection, but they’re durable and optimum for various wildlife. Regardless of the pond liner thickness you’re choosing, there are various underlays you can add to increase the toughness and durability of your pond liner. Pond grade underlay has a thickness of 150-180 grams/sqm and it’s better suited for a pond with normal requirements and wildlife. Heavy duty underlay is about 260 grams/sqm, and its thickness makes it perfect for increased protection against sharp rocks or debris.